It's been a busy morning, so only time for a quick review, but you guys know the basics of Azone dolls if you've seen my last review for Miu and the pics of Lien in Flickr. Aika arrived from Japan today and she's stunning! Naturally, after I imported both Miu and Aika, someone in the US is selling them for super cheap on ebay. Go look if you like these girls. I doubt you'll ever see a cheaper price! Here she is right out of the box. I didn't undo her clothes, but there are several layers, as is typical for Azone. And the separate bell sleeves are a nice touch. She's so pretty! I think she might actually be the prettiest of the 3. Her hat is on a plastic headband so it sits perfectly and securely. The chain was a separate piece that I looped over the hat. The wand is gorgeous, but the bat falls out really easily. I actually put a dab of super glue on it after these photos and now it's firmly affixed. I can't lose the bat! One more shot with a little better background. She's so gorgeous. I did take some shots of all 3 girls on their display space, but I didn't like how they came out, so that will be a project for later and I'll add the photos to Flickr. Bananas Series...er, Bunch...2 has just come out and I've been buying a lot of them, so I thought it would be fun to have a look at these, as well as my smaller collection of Bunch 1. Bananas are made by a company called Cepia. They're sold in packages of 3. They might also be sold separately, but I've never seen them in anything other than the 3-packs. They cost $9.99 each, although they're often on sale on Amazon and Target.com. 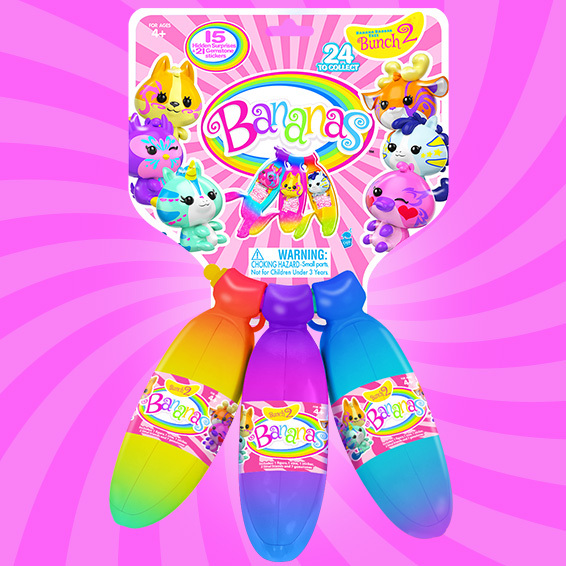 They're plastic bananas that smell like banana taffy, according to my mom, and they contain your typical blind-packed toy items. This is Jamie Jellyfish from Bunch 1. Here you can see most of the bits and pieces. Each banana contains 1 Crushie figure (I don't know why they needed the cutesy name), 2 smaller figures that are basically combinations of food and bugs, one character sticker, one sheet of rhinestone stickers (not pictured), and one stand. One of the three bananas will also have a copy of the checklist inside. There are the rhinestones. I typically throw these away, but this one snuck into my storage bag so here it is. And here are the stands put together and one of the small foodbugs. I stupidly did not try to put the stands together until tonight and therefore didn't realize how easy these are to display until tonight. So they're all in my closet now. Let's pause a moment to admire my purse rack. That is a handmade vintage coat rack clearly from the 80s because not only is it Rainbow Brite, but the name on it is Lori. I think most of us Loris are 70s and 80s kids. I found that on ebay and had to have it. Before we get into the individual characters, here's an example of the stickers. The same art is used on the checklists and website. It does not always accurately portray the toy. The colors can be a bit off. Like the lion and slug from Bunch 2 look more orange in their art, but the toys are yellow. Here are some of the foodbugs. I don't have all my collection out. There's one little baggie of stuff that I think is in one of my as yet still not unpacked bags that I brought over from the other apartment. But these are most of them, as I've bought a lot of Bananas recently and I think I only had 6 before. The Crushies are small enough, but the foodbugs are super tiny! Each one is a different food. Most are fruit, but there are also doughnuts, tacos, ice cream cones, and slices of pie. The accessories are completely random, except for the character sticker. The stands can be different colors for doubles of the same character, and so can the foodbugs. Totally random. And there are no differences between Bunch 1 and Bunch 2 that I've noticed. Andrew Monkey and Pipo Panda are two of the rare characters from Bunch 1. The checklist will tell you who each one's BFF is and there's a personality blurb on the website profile for each character, too. One different thing about Bananas is that they constantly tease new characters. Andrew Monkey's BFF is Marci Mouse, who is neither in Bunch 1 nor Bunch 2. She's one of the Lemon & Lime series. And while she mentions Andrew Monkey and Gail Giraffe in her personality blurb, she lists her BFF as Poki Sloth. Sometimes the BFFs match, but not always. Pipo's BFF is Terence Turtle, who's in Bunch 1 and who lists Pipo as his BFF in return. Here are Poki Sloth and Lacy Lizard. There are also errors between the website and the checklists. Poki's BFF on the checklist is Blu Otter, but on the website, it's Marci Mouse. All the BFF stuff is just random fun, not well thought out by the company it seems. Pia Pig and Jamie Jellyfish. Jamie's my 2nd fave from Bunch 1. Ofia Owl and Pop Unicorn. These two are a bit unusual for me, because you'd think I'd prefer the blue owl, but I actually really like the link unicorn. Maybe because she's got closed eyes. Mildred Cow and Robbie Rooster. Robbie is my #1 fave from Bunch 1. Mildred's #3. My grandmother's name was Mildred and I think she'd like this little toy. I spotted Bunch 2 at Target last week and bought all 4 sets. Then I've gotten 4 more over the past 2 days. I was doing quite well until today, when the 6 I opened were 5 doubles and 1 new. My 6 from yesterday were great though. I opened both these rares! Bubba Bigfoot and Bobert (really?) Bunny. Priscilla Puppy is one of my unexpected favorites. She's just really cute for some reason. And Onno Otter you'd think I would like more. Maybe it's because I have 3 of him that he's less of a fave. Hope Hamster was my only new one from tonight's pack. And Renee Rhinoceros is very cute. Bunch 2 definitely went outside the box. The most unusual animal in Bunch 1 was the jellyfish, but Bunch 2 has several odd ones, like Bubba Bigfoot from up above. Another is Snappy Venus Flytrap! I love this thing. It's so cute. And Sammy Slug. Who knew a slug toy could be that adorable? Lewis Lion is made more interesting because he's laughing, and Pistachio Unicorn is really pretty. Prettier than Pop Unicorn from Bunch 1, although she doesn't have Pop's cute face. Ducky Platypus is a bit of a disappointment, because from the front, he looks kind of like a bird. You don't figure platypus until you see his tail in the back. And then my favorite: Cindy Lou Cthulhu. Points to whoever added Cthulhu to a cutesy toyline and more points to whoever designed her to have that sleepy face and the most points to whoever named her. I love this tiny toy so much. Miss Alisah Spider must be Crushies royalty or something, because she's the only one to be Miss anything. Ariana Spider from Bunch 1 isn't a Miss! I love Alisah though. She's adorable with great colors. Zerba Zebra makes me want to smack whoever named him, but his colors are lovely. There are actually 3 characters in Bunch 2 with this same mold. The other two are ponies: 1 rare in orange and the other common in red. Celyse Cat was the first one I opened and then she made a pest of herself. I have FOUR. And Ura Deer has a punny name, but at least it's a cute pun. I definitely plan on buying more of these. Bunch 2 has an AXOLOTL character. I need that one! And the ultra rare is a darling alien. The others I'm missing are the rare moose and pony, and the common owl, canine (why not dog? ), pony and crocodile. So only 8 more to go for Bunch 2. Bunch 1 I need 14 more, but I like less of them. I want the spider, goat, chameleon and elephant, but not as much as I want the alien and axolotl from Bunch 2. If anyone decides to get into Bananas, I do have all these extras here to the right. I'd be very happy to trade for ones I don't have! PHOTO CREDITS: All mine except the first photo, which is from the Bananas website. I got my first Azone PureNeemo a little over 3 years ago. It was April 2, 2016. I always wanted to get more, but I never did until now! There are lots of photos of the body, different hands, etc. that I didn't do today with Miu. The Little Witches are my favorite Azone line by far. I love the dark outfits and lovely hair colors. With burgundy-haired Lien being my first, I wanted my second to be different, which is why I held out for Miu instead of Aika, the red-haired flame witch. I bought Miu a few days ago on ebay and she arrived today. You'll have to forgive my crappy review pictures, because my toy room is a mess and I have no good place to take photos. We brought over everything from our expensive storage unit so we don't have to pay for that anymore, and now I can gradually get everything set up in my spaces, but for the moment, things are everywhere! So Miu's posed in front of a packing box. Miu has very dark blue hair and purple eyes. Her expression is a bit more typical Japanese doll than Lien's is. Her outfit is in multiple parts. The jacket has a hook and string loop closure in two places in the front. Underneath that is her blouse. The ribbon is a separate piece. Then the heavy ruffled black skirt. Under the skirt is a stiff black mesh petticoat. The striped leggings are full leggings and not thigh-highs. She's got a little pair of black undies under those. And of course, the boots. I'm not sure how this wand signifies water. It's got a blue bit? Who knows? But it's pretty. Minus the cross part, but darker Japanese fashion seems to love crosses. It fits very loosely in her hand, but it's easy to pose for photographs and make it look like she's holding it better than she really is. The hat is a nice tight fit. It's not going anywhere, unlike Lemieux's frequently wandering nurse cap. Lien is pleased to not be alone anymore. She was getting annoyed at all the small newbies and no one else of her size. She'll be extra happy when she learns Aika is also coming! Yeah, I'll be pretty much buying these and Charlie Bears for a while. I need to catch up on bears before ordering a fourth girl, but soonish. A couple more shots of Miu with a prettier background. These girls are expensive, but you can see where the money goes. They're incredibly detailed for their size. A long time coming, but Miu was worth the wait! Hopefully, I'll be reviewing Aika for you soon. She's not shipped yet, but I only just bought her yesterday. More Rainbow ponies from the second set! I got so many email notifications for these two, but it took me eons to finally catch them actually in stock. Confetti's mane is a little wild. And here's Trickles with her watering can symbol. I did not think I was going to tackle this before work, but what the hey, let's do this. Today, I received the biggest package I've ever gotten, except for furniture. Yup, it is the Hasbro princess set for Ralph Breaks the Internet! It only took half an hour though. I was surprised. I'm not going to go on too long about any of these girls and I didn't take a body shot of anyone either. I may if there's interest, but I don't have another Hasbro princess doll on hand to compare bodies with, so I just stuck with pics of the princesses themselves. I'm going to go in alphabetical order, so here's Anna. Her top is one piece. That's her only flaw. She's super super cute! I love her. Each one has articulation at the neck, shoulders, hips, elbows and knees. Everyone EXCEPT Moana also has wrist articulation. They each come with a plastic accessory they can sort of hold. Anna has a bag of chips. Hasbro does Ariel really goofy. I don't know how they look at her animation and come to this end product. The outfit is cute though. Ariel's the only one with this drink accessory. Ariel has the best straight, long hair of the set. It's silky soft. Starfish barrette that's a little too large. She somehow manages to look cute, even though she really is ridiculously goofy-looking. I missed getting a full body shot of Aurora. It's nothing special though. Pink pants and pink slippers. Aurora's the only one with a pop (soda) can accessory. She has the worst hair of the 14. It was in two curly chunks on each side and then practically straight hanging down the back. It looks better now that it's brushed. I wish she had a bit more expression. This doll doesn't feel far off from a regular Aurora. Belle's a bit on the goofy side, but not like Ariel. Her outfit is kinda boring. Yellow shoes would have been nice instead of brown. She has one of the best accessories though: a book that can be either open or shut and she can hold it both ways. Cinderella is my sleeper hit of this set. She's one of the cutest dolls in here! Her outfit may be boring and I don't know how she got brown shoes, but the doll herself is so dang cute that I don't care! She's giving me Betty from Archie comics vibes. Cinders and Belle both have this hair bow accessory. If you had told me two of my fave dolls in a set of 14 Disney princesses would be the Frozen ones, I wouldn't have believed you, but it's true! Elsa is as well done as Anna. The range of motion on their arms isn't the best. Her top is a sort of fleecy material. Fitting for Elsa. I would have given her black or white shoes and let Cinderella have these blue ones. Gorgeous face! She's very expressive. Her outfit is perfect. Her face, hair and makeup are perfect. Her cup accessory is cute. I was really disappointed in the promo shots of Merida, because her eyes are so off. She's looking in two different directions, yet somehow, by some Merida magic or something, she looks adorable in person. She's got the same chips as Anna. Her hair has giant volume and it's fantastic. I love her outfit, even though the shirt is one piece. I wish the eyes were a little better, but she realy makes it work. I have no idea how! Biggest disappointment though? Right here. Moana is just like any other Moana doll, except she's got pjs on. She keeps her body type, which is great, but at the expense of wrist articulation? Not great. She's shorter than the other girls and she just looks like she doesn't fit in. If the entire set had body diversity, I would have been ecstatic, but it doesn't. So with everyone else looking the same, Moana really sticks out and not in a good way. She looks like she doesn't belong. She's adorable and she's well-made, but she looks like they just tossed her in from another line instead of giving time and consideration to her design. MY FAVORITE. Jasmine and Cinderella are up there, but Mulan is #1. Great outfit. Again, the shirt is one piece, but eh. It's still good. The overall design still looks great. I love her so much that I lack words to describe how much I love her. Pocahontas is a bit awkward. It's unusual for her, since she typically looks very glamorous. Same cup as Jasmine except brown. She was a little hard to photograph, so this is the best shot I got of her face. I loved the tiny Disney Store version of this Rapunzel, so this one's a disappointment. She's on the goofy side and her outfit lacks detail. They couldn't even make a fake shirt under the hoodie. It's just all printed on. I think she's the only one with the plain cup accessory. Still cute, but I prefer the sass of the mini doll. Ah, cross-eyed Snow. It works though. One of the best outfits. I love the rather unattractive color palette for her look. She has a great poison apple accessory. I wish more of them had character-specific accessories like Snow and Belle do. And finally, Miss Dimples. Tiana has some amazing hair! Hm, is that the same cup as Ariel? It might be. I honestly wasn't paying attention to all the different drinks. Cute outfit, cute face, great hair. And a great doll to end this on. I'm definitely pleased with this set overall. I think it's a great value at roughly $14 per doll. I'm glad I got the big set because it was fun to see and debox. So who's your favorite? Will you be getting these or do you prefer the Disney Store's smaller versions? Avid reader, writer, doll and plushie collector.